Dress your drink up in promotional style with this collapsible beverage insulator. Dress your drink up in promotional style with this collapsible beverage insulator. 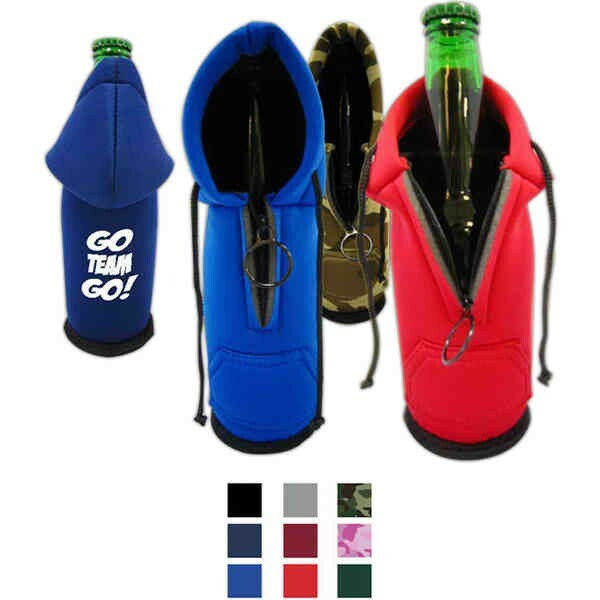 This "hoodie" insulator sleeve fits most bottles and looks just like a hooded sweatshirt with a zipper and is idea for easy drinking and advertising at tailgating parties, backyard barbeques, sporting events, company picnics and more. These drinkware accessories are a refreshing way to build brand awareness. Dozens of licensed artworks are available to customize your order. Choose your color options and add optional text to complete the look. Patent # USD688,102 S.